Arizona is known around the world for its majestic scenery. From the Grand Canyon of the Colorado River, which Major John Wesley Powell, a one-armed veteran of the Civil War, explored by boat in 1869, through the Ponderosa pine forests of Mogollon Rim, the setting of many stories by famed Western writer Zane Grey, to the exotic saguaro landscape of the Sonoran Desert in the south, Arizona is a place of rugged beauty experienced by more than 35 million visitors in 2007. Arizona’s 6.5 million residents live in such varied places as metropolitan Phoenix, the state capital, and the mesa-top pueblos of the Hopi Indians, the longest-inhabited communities in America. Whether in cities, villages, small towns, or on rural ranches, Arizonans have been living the history of this place since before there was a United States. In addition to the modern office buildings, high-tech manufacturing facilities, and state-of-the-art research centers are thousands of reminders of earlier lives. These include ruins of ancient Indian societies such as at Walnut Canyon National Monument, ghost towns from the 1800s, bungalow neighborhoods from the 1920s, and a Cold War-era missile silo with its Titan II rocket still in place. Whether you are a native or newly arrived, you will gain a greater appreciation for the wonderland that is the 48th state if you can tie together the many strands of natural and cultural history into a story in which you yourself are playing a part. The oldest of those strands—apart from the geological and biological stories that can be seen in the state’s mountains and canyons and in its flora and fauna—are those associated with the Native American tribes who have long inhabited this region. Their roots here date back some 15,000 years, when the first Paleo Indians lived by hunting and gathering in the arid and dangerous terrain. These early Arizonans began planting corn around 2,000 B.C., and thereafter began to develop societies of great complexity and cultural achievement. In central and southern Arizona, the Hohokam built a society based on agriculture supported by a vast network of canals, which drew water from the Salt, Gila and other rivers. 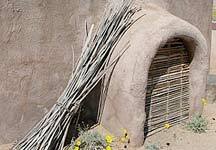 With their resources of farmed food and a large population, the Hohokam constructed numerous villages such as can be seen now in parks such as Pueblo Grande in Phoenix (pictured), Mesa Grande in Mesa, and Casa Grande in Coolidge. Further north, the Anasazi built large pueblos, many constructed in the sides of cliffs for protection, such as at Montezuma’s Castle in Camp Verde and Navajo National Monument on the Navajo Reservation. These societies were already in decline by the time the first European’s arrived in the New World, their place taken by the modern Indian tribes we know today. While many tribes in other parts of the United States were displaced from their traditional homelands, many in Arizona have been able to retain both their cultural identity and at least a portion of their historic land. In addition to the ruins of ancient cultures, visitors can see other aspects of tribal history from the tragic battlefields of the 19th century Indian wars, to symbols of cultural survival such as the impressive Council Chambers of the Navajo Nation in Window Rock (pictured), now a National Historic Landmark. 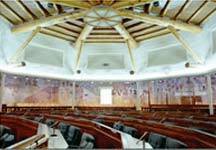 Built during the era of the New Deal in the 1930s, the Council Chambers resemble a traditional Navajo hogan residence, but within are carried out the functions of the tribes sovereign government, now fully acknowledged as a full partner in the future development of the state. On the San Xavier Reservation of the Tohono O’odham Tribe south of Tucson is a monument of another important strand in Arizona history. 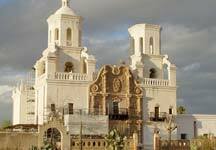 There stands the still-functioning San Xavier del Bac Mission (pictured), first established by the Jesuit missionary Father Eusebio Kino in 1700. Kino was part of a wave of explorers, conquerors, and settlers who came north from Mexico between 1540 and 1821 to expand the Spanish empire. The Spanish established a chain of missions, presidios (forts), pueblos (villages), and ranchos (ranches), primarily in the region of the Santa Cruz River. 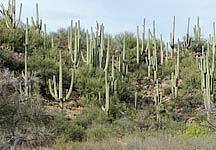 Tucson traces its history to a presidio garrison established in 1775. It was from another Arizona presidio at Tubac that an expedition of settlers led by Juan Bautista de Anza set out on a journey in 1775 that resulted in the foundation of the city of San Francisco. After gaining independence in 1821, Mexico exercised authority over Arizona until the United States gained control of the region following the Mexican-American War of 1846-48. Although no longer sovereign, the proximity of Mexico to Arizona has had an important influence on the culture and people of this state. Arizona has long drawn workers and families from Mexico who worked in its mines and on its farms and ranches. People of Hispanic ancestry account today for approximately 30 percent of Arizona residents. Landmark events of modern Arizona history include the arrival of the railroad in 1881, which opened the state to mass settlement and development. 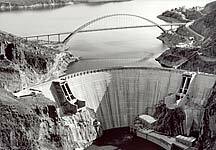 Construction of Roosevelt Dam (pictured) on the Salt River in 1911 and Hoover Dam on the Colorado River in 1935 harnessed the great rivers for hydroelectric power generation and the reclamation of desert lands for agricultural and urban uses. World War II opened the state to industrial development, and the post-war era of suburban growth transformed the former small town of Phoenix into one of the largest cities in America. Whether it relates to ancient Indian cultures, intrepid Spanish missionaries, ambitious American pioneers, or modern families looking for opportunities to build their livelihoods, Arizona is a historic land. Arizona State Parks was established in 1957, in part to preserve some of the important places associated with that history. 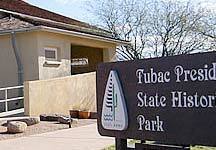 These historic parks educate Arizona’s citizens and visitors about important aspects of the state’s history, such as lumbering in northern Arizona, ranching in southern Arizona, Spanish settlement at Tubac (Arizona's first state park Tubac Presidio State Historic Park, pictured, is in Tubac), and copper mining in the Verde River Valley. Visit a park soon and become a part of Arizona’s cavalcade of history.